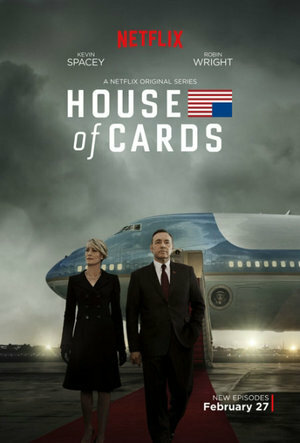 The latest season of House of Cards opens with Frank Underwood on the verge of becoming a sitting duck president, his empire slipping through his fingers like sand. And that empire’s foundation – his marriage – appears to be falling to pieces as well. Frank, on several occasions in this new season, states that he isn’t good enough for his wife. And by all accounts, this is the plain truth. Where Frank operates like a brutal tyrant, Claire, though equally calculating, always enacts her devilish plans with class. But despite Claire being perhaps even more talented at manipulation than her husband, she’s always played second fiddle to him. When Frank needs someone to infiltrate the United Nations, he uses Claire. When he needs someone to charm a Russian leader, he trots out Claire. When he needs his confidence replenished – Claire. Like many real-life first ladies, it’s frustrating to watch Claire live in her husband’s shadow, and as has always been the case with the series, Claire’s turmoil is as entertaining as it is meaningful. Season three is far from perfect. Like a nasty cold passes from one person to the next, one of the series’ most exhausting subplots continues to be passed along season to season. Doug Stamper isn’t that interesting a man, so it’s hard to understand why so much time is spent on him and his obsession with a long lost love interest. Who actually cares who Doug is in love with? His story’s constant reappearance is an indication that the show’s creators are possibly running short on creativity. Doug is a distraction from the show’s most interesting component – the crumbling relationship between the first lady and the president. This third season doesn’t reach the dramatic heights that the series’ opening does, but it far exceeds the blandness of season two. Is season three worth watching? Sure, if only because season four threatens to outdo them all.